BORN IN PENNSYLVANIA IN 1965, THOM BROWNE MOVED TO NEW YORK CITY IN 1997. HE WORKED IN THE GIORGIO ARMANI SHOWROOM, EVENTUALLY LEADING TO A POSITION IN THE CREATIVE DEPARTMENT OF CLUB MONACO, WHERE HE STAYED UNTIL LAUNCHING HIS OWN LABEL. BELIEVING THAT THE MODERN UBIQUITY OF CASUAL DRESS LENDS THE WEARING OF SUITS A SORT OF SUBVERSIVE EDGE, BROWNE HAS CLAIMED AS HIS SIGNATURE IMPECCABLY-TAILORED SUITS IN TRADITIONAL WOOLS AND FLANNELS, EACH WITH UPDATED PROPORTIONS. INITIALLY SHOCKING TO THE FASHION WORLD, HIS DESIGNS HAVE PLACED HIM AT THE VANGUARD OF MENSWEAR. 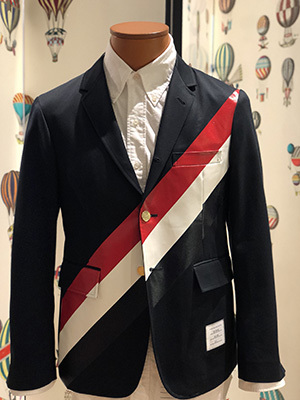 THOM BROWNE DRAWS MUCH OF HIS INSPIRATION FROM CLASSIC AMERICAN STYLE BUT REFRESHES THE CUTS WITH PREPPY DETAILS SUCH AS SHRUNKEN FITS, GROSGRAIN TRIM, AND CROPPED TROUSERS.